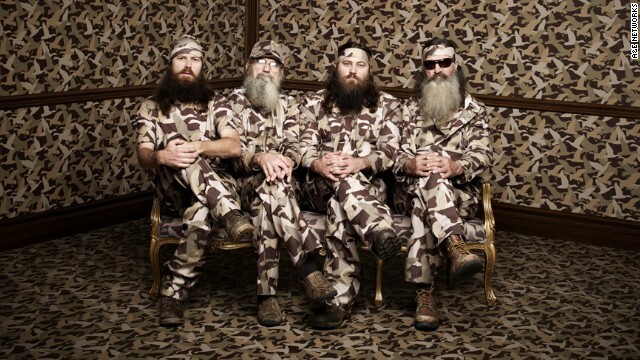 I don’t watch much television, but when I do, it’s not Duck Dynasty. Frankly, I’ve only seen parts of a few episodes, which didn’t keep my attention for long. That’s not to say that the show isn’t entertaining, because if it wasn’t, then millions of people wouldn’t be tuning into every episode. Whether you like the show, hate it, or have never seen it, chances are you’ve heard about it, or seen their merchandise at your local Wal-Mart. The Nation has officially gone Duck Crazy, and with Phil’s recent comments, there will be no one left from hearing the Duck Gospel. What I find interesting is how so many evangelical Christians are inflamed by A&E’s decision to ban Phil from the show. Their majority position is that Phil was excercising his freedom of speech, based on his Biblical convinctions. However, what they aren’t acknowledging is the apparent bigotry and ignorance, particularly involving homosexuality. Phil went on by lumping homosexuals in with terrorists. Whether his heart was in the right place or not, his mouth and mind weren’t, and to compare homosexuality to terrorism is completely irresponsible to say the very least. Freedom of speech doesn’t give anyone the right to say whatever they like, regardless of the injury to others, and then blame it on their belief system. The family did release an official statement this morning, which did not include an apology for Phil’s comments. They did acknowledge them as “unfiltered” and then offered a scripture on loving thy neighbor, which I thought was odd, because it certainly didn’t sound like his comments were promoting love and acceptance. From what I’ve seen, read, and heard about the Robertson family, they seem like good people. Perhaps this will give them an opportunity to grow, learn, and gain a whole new demographic…LGBT. Wouldn’t that be crazy? Some real Jesus stuff. How has Phil’s comments affected your attitude towards the show?